Injustice 2 took a lot of fans by surprise when it revealed the contents of its second Fighter Pack back in August. Sure, Raiden and Black Manta were expected to be added to the game, but Hellboy? Pretty much nobody saw that one coming! But hey, NetherRealm Studios (who also make Mortal Kombat) and Hellboy are pretty much a perfect fit, so most fans are hotly anticipating the big red lug’s return to video games. Well, NetherRealm and publisher Warner Bros. Interactive just turned the hype dial up another notch by releasing the first full Injustice 2 Hellboy gameplay trailer. Check it out, below. As you might expect, Hellboy is a heavy-hitter, knocking his opponents off their feet with his signature “Right Hand of Doom,” then pummeling them once they’re down. That said, he also has some zoning abilities, thanks to his trusty pistol – it seems like he’ll be one of the more balanced brawlers in Injustice 2. Oh, and yes, Hellboy’s Super Move involves him literally beating his opponent through the crust of the earth into Hell, because of course it does. As you may have noticed, NetherRealm aren’t much for subtlety. 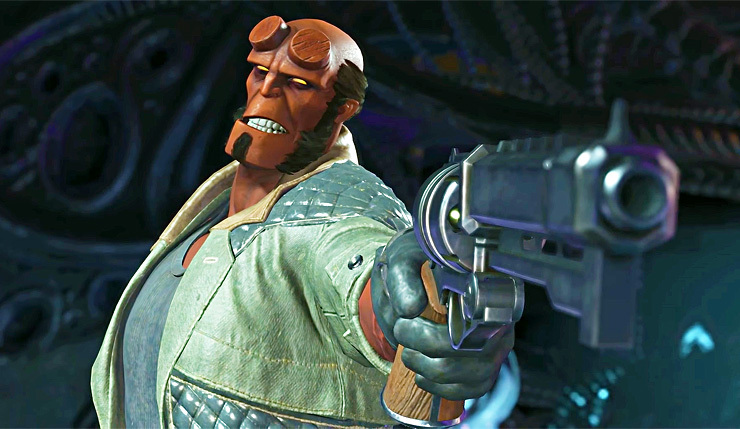 Hellboy is the final character in Fighter Pack 2, which also includes Aquaman arch enemy Black Manta and Mortal Kombat favorite Raiden. Injustice 2 Fighter Pack 2, which includes the three new characters and a Reverse Flash Premium Skin, can be purchased for $20. If you’re only interested in Hellboy, you can grab him à la carte for $6. Injustice 2 is currently available on Xbox One and PS4, but a PC version is expected to arrive before the end of the year. Hellboy heats up the game on November 14. What do you think? Excited to throw down as Hellboy? I’ll admit, slower fighters aren’t usually my cup of tea, but I’m a huge fan of the character, so I’ll give him a chance.